The guide mentions taking a system restore of your settings prior to making any changes so you can always roll back, which is essential in case you muck things up and can’t work out which service controls what. Once you have worked out which services you don’t need and disabled them it is time to create a script that will automate the task so that if you reinstall you won’t have to go through the painstaking process all over again. Fire up notepad.exe. Open another window to Services (My Computer\Manage\Services). In the properties window of the services window double click the service at the top of the list. In the properties windows that appears we are interested in the service name at the top. Not the Display name (although it will often be identical). 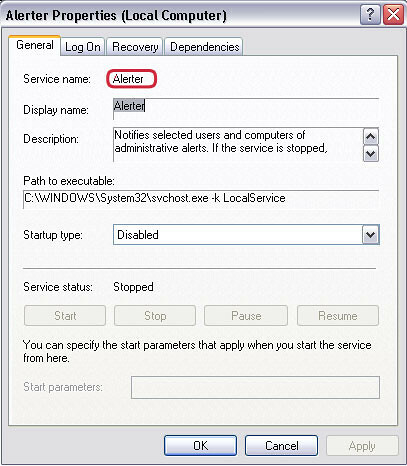 Repeat this process for each service, replacing their service name in a new sc config line and setting their status to one of disable, auto, demand (i.e. manual) as you have them configured according to the guide. Once you have finished save the notepad document into a new folder (Scripts is a good name) and call it something like Services_Disable.bat. You may have to select All Files from the Save As dialog rather than Text. Execute it from a cmd window and fix any typos. And wow do I notice a performance increase. I hope you do – and enjoy never having to tweak all those services again! FYI, when using your script as a starting point, I had to S&R the curly quotes above with straight quotes to get it to run. How do I stop and disable a single service for a group of windows servers using the sc comand and a list file? I will be a no good for nothin three bitten hound dog,,, it worked!!!!!! Any way to get the list of ALL services, then disable all except the ones in a list that you choose?